Istro-Pontic Cross-Border Tourist Chamberwas founded in November 2011. 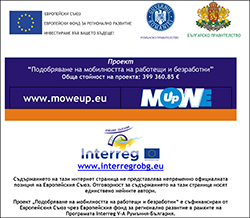 It was set up by EUROPARTNERS Association andEurekaEuropean Institute of Cultural Tourism – non-governmental organizations from Dobrich, Bulgaria, and the National History and Archaeology Museum - Constanta, Romania. The members of the Chamber have a long-term experience in the public sector and the Dobruja tourism development support. They share the EU values ofgood neighborhood policyand cooperation between cross-border communities. Our main objective is to achieve sustainable mutual social and economic development by placing value on the yet unused, due to the many years of separation, opportunities and unique advantages of the cross-border region along the Danube and Dobruja. We established this cross-border chamber in order to join the efforts of all interested parties from the cultural institutions, tourist businesses, local authorities, non-governmental organizationsandeducational institutions aimed at setting up and developing Cross-border Istro-Pontic Destination for Cultural Tourism, using in an efficient, ecologically aware and sustainable way the region’s competitive advantages: its unique cultural and historical heritage and natural resources – various great cultural and historical monuments, ethnographic and natural landmarks, a major part of them being of international and worldwide significance. Through the Istro-Pontic Cross-Border Tourist Chamberwe also strive to bring closer, both socially and culturally, the people living in the cross-border region, to increase trust and consolidate their communication and ultimately contribute to their well-being. The mission ofIstro-Pontic Cross-Border Tourist Chamberis to support the parties interested in the development of the Cross-border Istro-Pontic Destination for Cultural Tourismfacilitatinga better regional development and the social and cultural well-being of local communities. Cooperation with Bulgarian and international organizations and institutionsin performing joint activities, initiatives and projects related to the achievement of the organization’s objectives. Carrying out various studies and analyses of the prospects, trends, policies, approaches and good practices for supporting and developing the competitiveness of CIPDCT. Any other activities contributing to the achievement of the Chamber’s objectives and not prohibited by law. More information about the Chamber can be obtained from their official website by clicking here!